What’s a summer picnic or barbecue without potato salad??! Here’s a great low sodium recipe you won’t hesitate to share. Fresh, flavorful and mayonnaise free, your guests will LOVE the difference. Place diced potatoes in a pot and add water enough to cover by about an inch. Bring to boil over medium-high. Once boiling, reduce heat to medium, and simmer, stirring once or twice, until potatoes are tender, about 7 minutes. Drain potatoes and transfer to a large bowl. Add the vinegar and, using a rubber spatula, toss gently to combine. Let stand until potatoes have cooled slightly. Meanwhile, in a small bowl, stir together the celery, relish, onion, oil and seasonings. 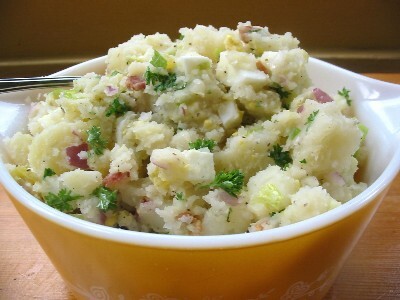 Once potatoes have cooled, pour the mixture over top, along with the diced egg and bacon, and gently fold into potatoes. Cover and refrigerate until chilled, about an hour. Can be made a day ahead of serving. This entry was posted in Salads and Dressings, Side Dishes. Bookmark the permalink.